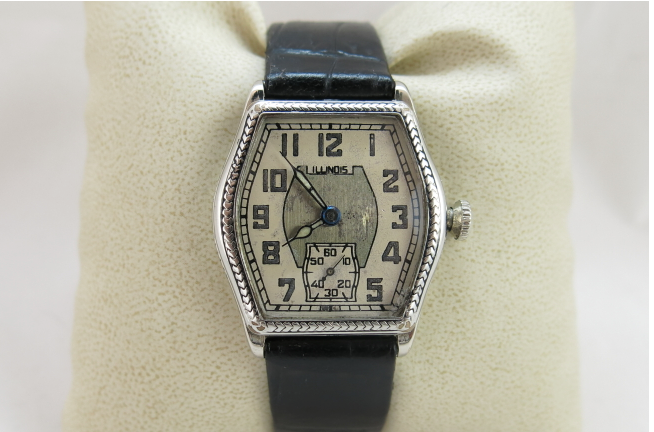 Hamilton acquired the Illinois Watch Company in 1927 and continued to make the line of Illinois watches into the 1930s. 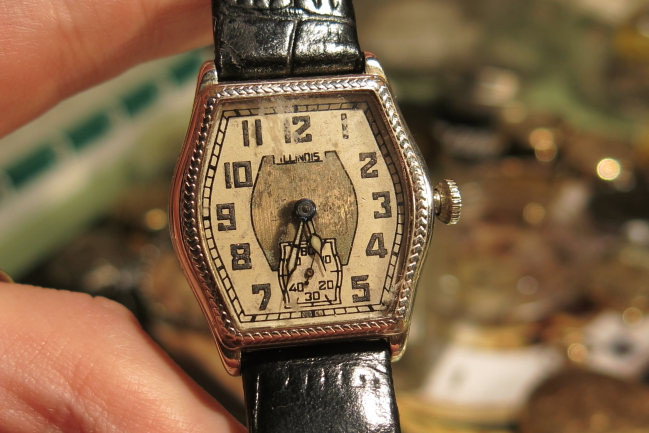 However, Hamilton also produced Illinois-branded watches into the 1950's. 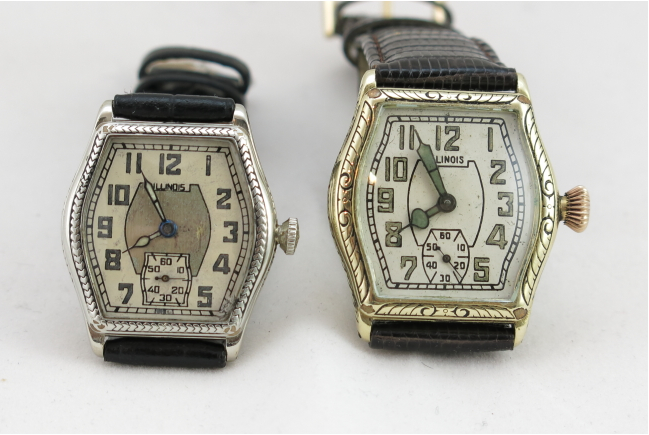 Most Illinois-purists consider the "real Illinois Watch Company" period to be the 1930's and earlier and don't consider the 1950's watches true Illinois watches. I recently had the opportunity to overhaul a 1931-ish Illinois Ensign. I couldn't find a catalog image of the Ensign so I could be off on my dating but the serial number of the movement puts it in 1931. As received, it was running off and on and was pretty dirty - but otherwise in very nice shape. Under the dial is an 6/0 sized 17 jewel Illinois 607 movement. After cleaning the movement, polishing the case and re-enameling the case engraving, I think it turned out really well. If the Ensign looks familiar, it could be because it has a bigger brother called the Mate (Special Model H) which has a larger 3/0 sized movement. The Mate is a really nice sized watch and very large by vintage watch standards. A WONDERFUL job on those 2 super Illinois. are both original examples. Would make a great addition to someone's collection! I have an excellent YGF Ensign w deteriorated dial, especially around the seconds sector (9 position). The watch has been overhauled recently and wo case wear through. What is the cost to refinish the dial. I would prefer sending the watch instead of removal and reinstallation of dial and hands. Photos can be forwarded if desired. Hey John, There aren't that many dial refinishers out there (I can think of three) so any watchmaker you use will be sending it out. You could also bring it to a local jeweler and see if they will remove the dial for you and reinstall it when you bring it back. That way you can "skip the middle man" and take care of it yourself. You'll want to send the hands with the dial so they can be redone to match. As for cost, it will run you about $65 if you did it yourself and probably another $30 if you ask someone to do it for you.